Home › Moorhouse Farm Solar Array › Moorhouse Farm Solar Array – now under construction. Moorhouse Farm Solar Array – now under construction. Following a couple of holdups the solar array is now under construction with access tracks, fencing and boundary security systems largely in place. You can see one of the cameras and connection box on the pole in the photo above. 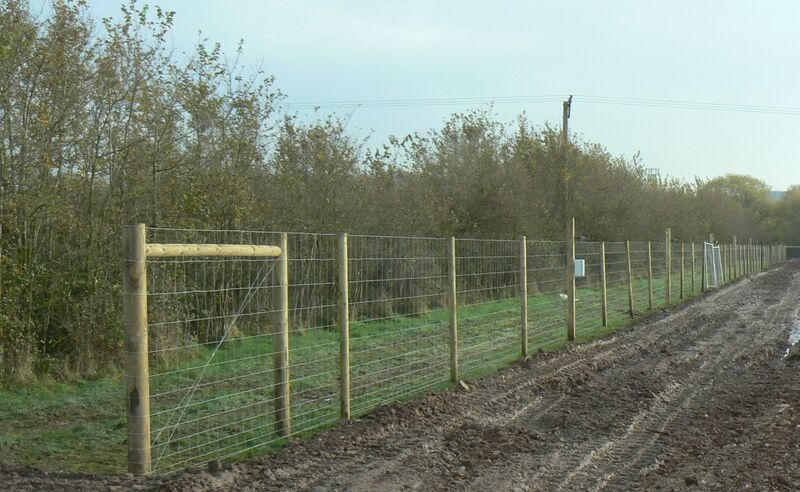 Just over 1 kilometre of 2m deer fencing is being erected with some 60 video cameras installed to monitor the perimeter fence. These are already operating and connected to a central control centre ensuring a secure site before the main installation starts. The array mounts and tables will be installed starting this week with panel installation following on a week later. All this activity is visible from the M5 motorway looking west from the northbound carriageway just after the M49 junction. The start of construction has been delayed because of the need to cross a strategic oil pipeline that runs just north of the array. Permission to cross this took longer than expected and a temporary bridge has been installed to bridge over the pipeline. 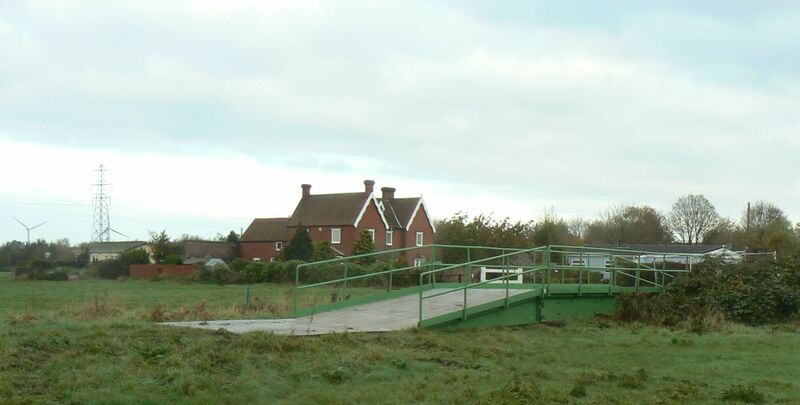 A permanent crossing is being constructed alongside the temporary one. We are working with Avon Wildlife Trust to safeguard the existing wildlife potential of the site and will be carrying out works to enhance the site’s biodiversity as part of ongoing management. Sarah Dale, the Trusts chief ecologist, has carried out a roosting bat survey and has highlighted the trees that need to be protected. She has also found signs of water vole activity and has advised the contractors of the steps they need to take to protect this species. 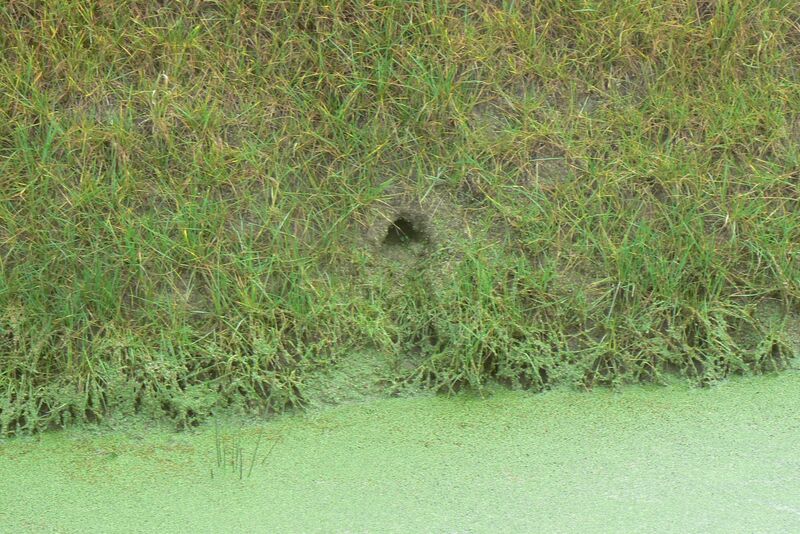 The photo below was taken on the site and shows a water vole hole in the bank of one of the rhines. Avonmouth is a local stronghold for this species and it is good that we can play our part in its protection and conservation. We have also asked the Trust to review the long term management plan for the site, and will be using them to monitor the effectiveness of its implementation over time. Despite some delays the contractors, Solarsense, are still confident of meeting the deadline of energising the plant before Christmas. We visited two locations in North Somerset where small solar parks are being planned and where we are being invited to become the owner and operator. The first, an 800kW site, has just been submitted for planning permission; the second for 1.2MW will be submitted in the next two weeks or so. We are in detailed negotiations with the site developer and if all goes well we will be issuing our second share offer in the new year for these two sites. As well as these two solar schemes we are negotiating for a 500kW wind project which will take rather longer to come to fruition. We are also in discussions over a number of school solar projects so 2015 should be a busy and fruitful year!